Musicians are subject to hearing damage as an occupational hazard. In Europe, hearing protection for professional musicians is mandatory! Historically, musicians used wedge monitors to project the sound they were producing back at themselves so they could hear what the audience was hearing. Today, most musicians use in-ear isolation earphones (called in-ear musician monitors, or IEMs) to monitor the music they are making, allowing the musician to clearly hear his or her own sounds while also protecting the musician's hearing from the dangerously loud amplifier systems used to project the performance to a large audience. 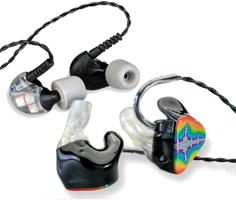 The best in-ear musician monitors are custom molded to fit that particular musician's unique ears. Running a close second are universal fit musician monitors -- off-the-shelf monitors that provide a semi-custom fit through the use of interchangeable foam or silicone tips. For our extensive selection of earphones suitable for the most demanding professional monitoring applications, please browse the custom and universal fit musician monitors below. Universal Fit Musician Monitors are the best in-ear earphones for live music monitoring you can get without going with full-custom monitors. Universal fit musician monitors are off-the-shelf in-ear earphones with professional quality components and drivers, and they come with a variety of ear tips to ensure a good fit for anyone.